John Frye is a Digital Modeling Group Leader at Honda. He’s a professional automotive designer. That means when he decides to do a little bit of imaginative automotive artwork for fun, it ends up being the sort of thing that grabs your attention and makes you feel funny way deep in the car-glands. He’s been working on a series of model boxes of autonomous F1 cars from an alternate reality, and they’re fantastic. I’ve met John at two Sketchbattles so far, and I’ve always been impressed with the work he does. He has a very natural affinity for automotive design, and the work he produces reflects that. In this series, I really love the sci-fi/alternate history angle he’s taking. He’s imagining an alternate timeline where autonomous driving technology was mature enough by the 1960s that a whole alternate F1 series was developed for driverless cars. That’s a fun background to keep in mind as you look at these, though I think what I really like best about them is how he’s taking familiar, iconic cars of a number of eras and adapting them to his new history. 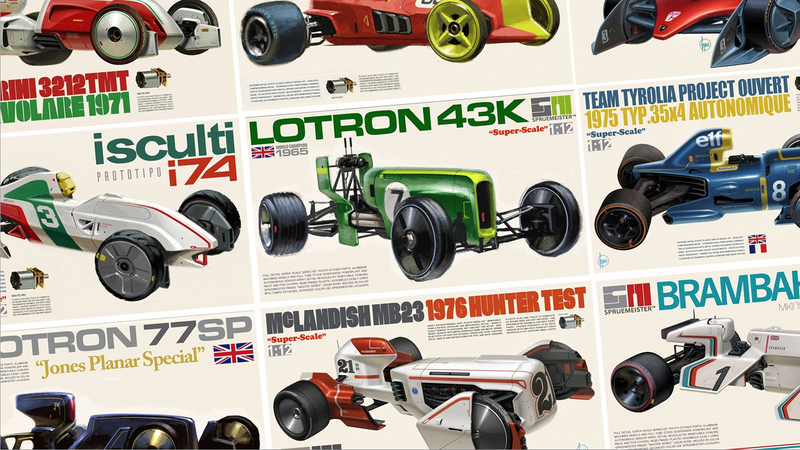 That’s why we get alternate-universe versions of the Tyrell six-wheeler or the famous John Player Special-livery’d Lotus 77. It’s fun finding the references and influences, and it’s fun interpolating the technology standards of the new universe, like the sensor pod units at roughly driver-head level. The choice to have these portrayed in the context of model kits just adds another level of fun to the whole thing, and provides a nice way to integrate some names and details about the cars into the artwork. Plus, he’s made some actual boxes of these cars, which just makes me wish someone with a 3d printer and some spare time might make the cars themselves. I absolutely adore this project; the aesthetic is both familiar and just alien enough to be really interesting, and I love the retro-futuristic dichotomy of some of these ‘aged’ looking boxes showing cars that use technologies we haven’t even fully mastered today. Well, in our boring old universe, at least.